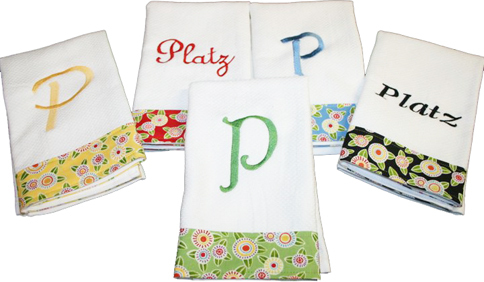 Each hostess towel comes complete with embroidery and/or monogramming for $11 per towel. Our hand towels are 100% cotton and measure 20" x 16.75". For a closer look at the thread color chart or monogram fonts offered, click the buttons below. Because each item is custom made, please allow 7-10 business days for processing. Enter monogram wording exactly as you would like it to appear --- all lowercase, single initial or monogram. If selecting monogram please include full name and how you would like monogram to appear embroidered. Enter any special instructions you have for your order including any font or thread color changes from item listed.